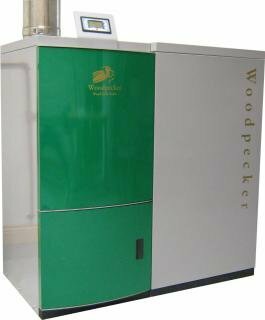 Webiomass pellet furnaces are made in Rutland, Vermont under license from Woodpecker Energy, a respected UK producer of pellet boilers. Eighty five percent of the systems produced by Webiomass are made locally in Vermont. The burner unit is self cleaning using compressed air. The boilers' secondary heat exchange tubes are also self cleaning using a clever piece of design in which the automatic ash removal augers also act as turbulators. A buffer tank is always recommended for Webiomass pellet furnaces as this reduces the need for the furnace to ignite and shut down, giving greater efficiency, reducing emissions and creosote build up in the flue. In case of a power outage, or overly high temperature in the pellet feed pipe, an automatic shut off valve closes the pellet feed. On the residential systems, ( Woodpecker 25 and 45 ), there is the option for ashes to be augered into an ash box which reduces the necessity to empty the ashes. This is standard on the Thermon. The hopper has a low pellet level sensor. The highly advanced digital control systems tell you everything you could possibly need to know about the functioning of the boilers - from flue temperature to when the system is being automatically cleaned. Monthly - scrape the burner and brush down the boiler side walls. Annual - service by boiler engineer. Max. Heat Input 85,000 btu. Automatic emptying into a separate ash box. ( adds to width of unit ). Max. Heat Input 153,000 btu. 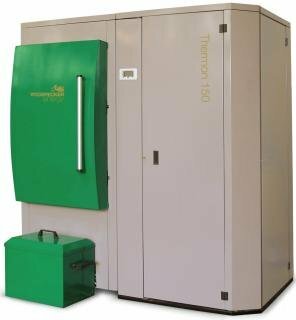 Additional features of the Thermon pellet boiler are a UPS switch that automatically switches to backup power in the event of a power outage. A built in modem allowing technicians to access and control the unit off site, and giving the owner the ability to turn the unit off or on and monitor the boiler remotely. Max. Heat Input 500,000 btu.